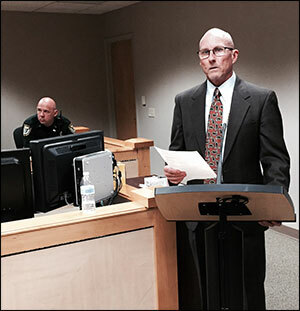 Paul Rice, pictured here, Chair of the Volusia County Bar Association's Family Law Section, conducted a meeting of the group on April 29, 2015, at the Volusia County Courthouse Annex. Approximately 35 family law attorneys attended along with Circuit Court Judges Dawn Nichols and Matthew Foxman from Deland and the Circuit's newest judges, Karen Foxman and Kellie Miles, from Daytona Beach. The group collectively discussed a range of issues confronting family law practitioners and judges as it relates to procedures, hearings, trials and recent developments in the law. The Section meets three times a year, with two meetings being in Daytona Beach and one in Deland, Florida.